Lucy’s hemoglobin was at 6.0 and her platelets were at 50,000. Dr. Nashawaty had rounds this weekend and he mentioned the irony of keeping Lucy on heparin but also having to transfuse platelets. Her Alimta treatment probably caused the platelet count drop and to her low hemoglobin level. On the plus side, her heparin is in therapeutic range. She will be in the hospital until at least tomorrow. One of the criteria for release is getting her off IV heparin. Our guess is they would also like to see any risk of infection in her leg eliminated and a noticeable improvement in her leg. It appears her leg is getting a little better. Like her last hospital stay, this will be a day-by-day event. Today saw a steady stream of nurses and nurse’s assistants in and out of her room. Lucy said one of her arm blood draws was at 3:00 am this morning. Her port has heparin in it so certain blood tests must be done via her arm. Lucy’s appetite is still good. I went to the cafeteria and picked up a grilled chicken sandwich for lunch. She asked to sample it and wound up eating the whole thing. Steve and Liz came by this morning and brought cookies. 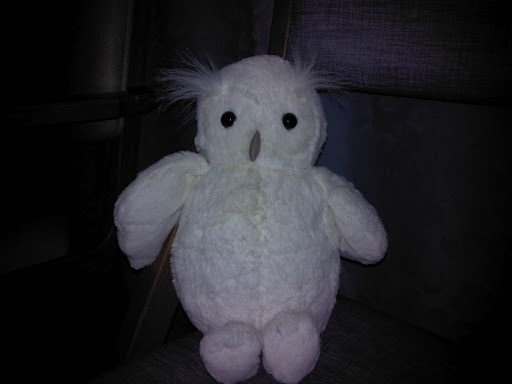 Suzy was by this afternoon and left a stuffed snowy owl and a couple of magazines. Julie called to see how Lucy is doing. We also appreciated all the great notes from everyone. Lucy and I do read the comments left in the group or in the blog, and we thank everyone for their words of encouragement. We’re hoping her heparin stays in therapeutic range tomorrow. 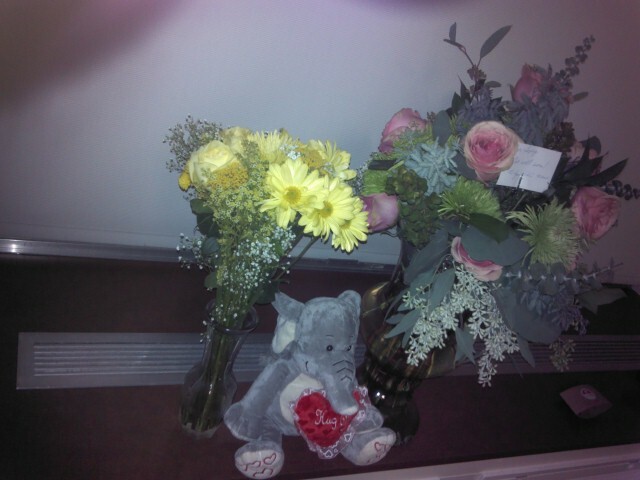 That will put her one step closer to going home. 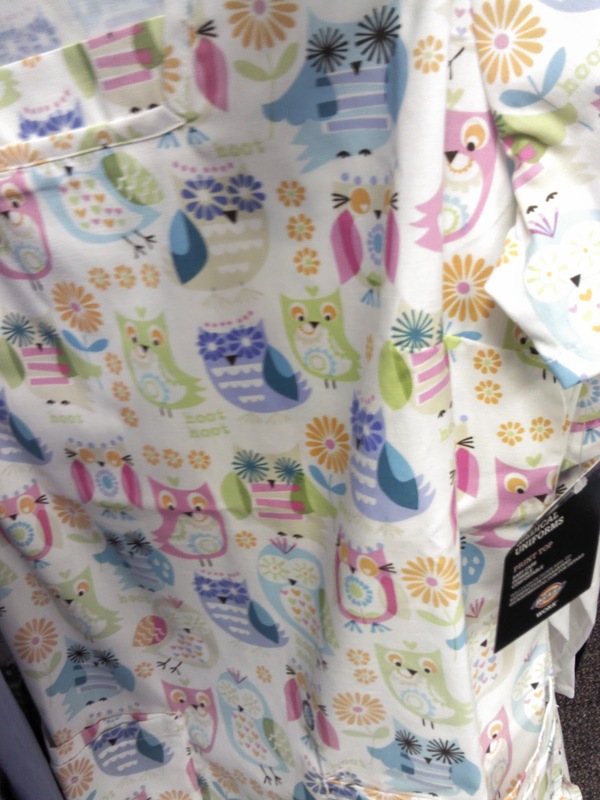 I found this scrub top in the gift shop. Lucy wants to see it when she is more mobile. I’m sure she will get one. This morning started with a 75-minute nosebleed. Lucy was to start using Afrin nasal spray but her bleeding started moments after the first spray. She then switched over to a saline gel. Diane visited Lucy this afternoon. It really helped Lucy’s mood. Diane can get Lucy laughing which is really needed now. Thank you, Diane! She also suggested the title for tonight’s post (it was originally “Let It Bleed”). Between the nosebleed and the blood draws, Lucy could have supplied the blood for this season of “Dexter”.Lucy is still running a temperature of around 101°F. They are running an IV antibiotic and she is getting Tylenol for her temp. They also drew blood to see if her blood thinner dose needs adjusting. Blood thinners are very touchy. Then they drew blood again looking at her Heparin Factor A, and then drew a third time for blood cultures (again). She also received two large heparin bolus doses. It sounds like Suzy is going to visit Lucy tomorrow. Unfortunately, when Suzy called tonight, Lucy had a lab tech wrapping a tourniquet preparing for a blood draw and two nurses reviewing the heparin bolus double-check and co-signing procedure. Things do get a little hectic in the hospital. Keep Lucy in your thoughts and prayers tonight. Thank you for all your support! Lucy’s leg started getting worse this morning. She called Minnesota Oncology and they set up an appointment for 2:00 this afternoon. Her nosebleed started at 1:30 and finally let up around 3:00. The nurse practitioner at Minnesota Oncology helped Lucy with her nosebleed. Anticoagulants are so fun. Dr. Thurmes also contacted her while he was at Fairview Southdale on rounds. She was admitted to Fairview Southdale as a precaution. Lucy also had some extra blood work drawn along with blood cultures. They need to wait 18 hours after her Lovenox injection before they can start IV heparin. That means she will get awakened at 4:30 am. She just had completed an IV antibiotic because they suspect cellulitis. An ultrasound of the left leg found that the clot in her groin was solidifying. We are hoping she will not need a TPA catheter tomorrow. In the past few hours, she started running a fever, which is at about 102°F right now. The Tylenol will help reduce the fever. It is frustrating that this clotting problem flared up again. More than likely, she is here until Sunday. We were looking forward to a nice quiet weekend at home and having her leg continue to heal. Now it’s back to a wait and see mode. Keep Lucy in your thoughts and prayers this weekend. It helps us get through these setbacks. At least I don’t have to play Nurse Ratched with the Lovenox while she’s in the hospital. See, I did manage to find something positive.